Wedding cakes – So many to choose from! I think might have mentioned before that I used to be a Science teacher and only really ever baked for fun. It was actually a form of stress relief therapy especially after trying to teach photosynthesis to bottom set Year 9! It was only after a friend asked me to make her wedding cake and I foolishly agreed that I started to take baking seriously. I enrolled in a night school to learn sugarcraft so that my first wedding cake wasn’t a complete disaster. I have come a long way since that first wedding cake (shown above) and have made a fair few wedding cakes since, some of which are included in this blog. Making a wedding cake is a huge responsibility and one that I take very seriously. That first meeting with the bride and groom is so important and one during which I ask dozens of questions and write copious notes. “What sort of things do you need to know?” I hear you ask. Well, I’ll tell you! What sort of wedding is it? Traditional, contemporary or themed? How big do you need it? Basically how many people does the cake need to feed? Is the cake being served as a dessert or simply being given as a piece of wedding cake? If it is the former then the slices need to be considerably larger. 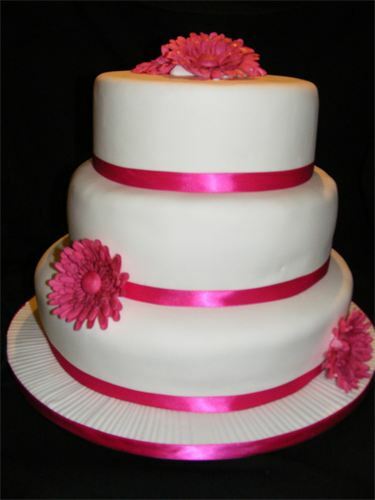 * Many brides are choosing to serve the cake as dessert thus reducing catering costs. Be aware, however, that some venues will still charge you to cut and plate up the cake. Do you want a round or a square cake? You get more slices from a square cake than from the equivalent sized round cake. What kind of cake do you want? 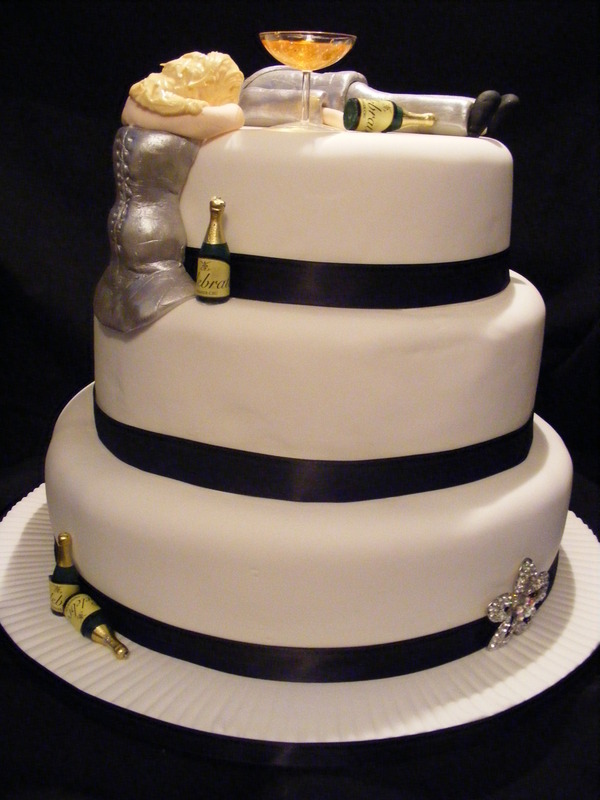 Traditionally wedding cakes were always fruit with marzipan and Royal icing. These days anything goes! I recently made a wedding cake that had one tier vanilla sponge with jam and buttercream, another chocolate fudge and the top-tier was lemon damp cake with homemade lemon curd! Not a fruit cake in sight! I am quite often asked if the top-tier cake be a fruit cake because “Granny and Great Aunt Mabel have to fruit cake otherwise it is not a proper wedding!” They are quite shocked when I say “No!” The weight of a fruit cake is far too heavy to place on top of a sponge cake, even if the cake is properly dowelled. As a compromise I often provide a separate fruit cutting cake. Similarly, a lot of brides want the look of a big wedding cake but are desperate to keep the cost of the cake down. I have made several cakes recently where at least one tier was a dummy cake made from polystyrene but iced to look like the real thing. Well, I won’t tell if you don’t! what colour do you want the flowers / ribbons? They usually match the bridesmaids’ dresses or bridal bouquet. I ask for a swatch of fabric so that I can match it as closely as possible. Do you know how many shades of fuchsia there are? The cake below reduced me to tears at times when trying to match both the ribbons and handmade roses to the watermelon coloured bridemaids dresses! Where are you getting married? This may seem like a silly question but I have been caught out by not asking it! The cake and cupcakes below were for a vintage style wedding upon the Llangollen Railway. What I hadn’t realised was that the train would be moving! Doh! Needless to say the cupcakes had to be stuck to th cakestand to prevent them from flying across the carriage! Do you want the cake personalised in any way? 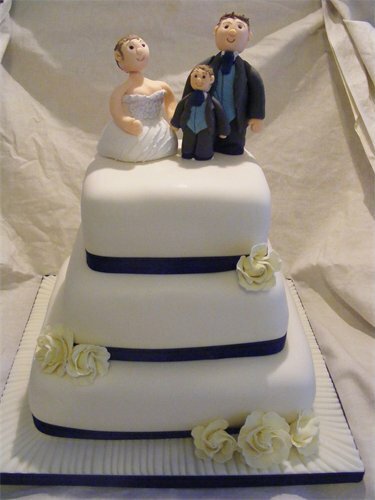 Quite often I am asked to include children on the wedding cake. 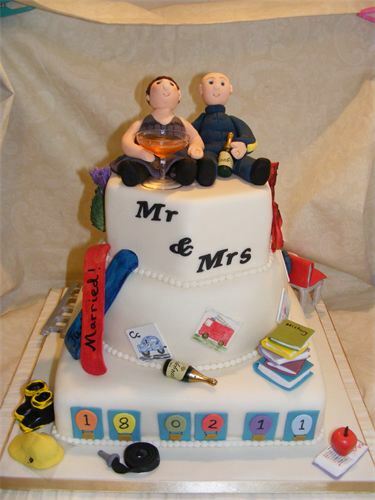 I was also asked by a couple who had “done the big white wedding” in their first marriages to make their cake about them, their interested and their relationship. She was a primary school teacher and he was a fireman. They both loved snowboarding and wine! They were absolutely thrilled with what I came up with. What colour do you want your cake? More often than not they reply either white or ivory but every now and then you get a bride that surprises you. As I said anything goes these days! Now you can see why I ask so many questions! So, what are my words of advice for bride-to-be looking for their dream cake? Find a cake maker you like and trust. Listen to their advice regarding what can and can’t be done. (You really can’t have fruit as your top-tier if the rest is sponge! Honest! ) A good cake maker will not brow beat you into having something you don’t want. Know your budget and the maximum number of people the cake is for. That way the cake maker can give you all the options in your price range. Remember this day is about the two of you, not Great Aunt Mabel or keeping up with Jones. Your cake should be what you want! I hope you have found my rambling useful!